L.G. Peterson had a fascination for cars. As an ambulance driver and mechanic during WW1 he saw the motorized automobile make its way into the military and the American lifestyle. In 1928, his dream of owning his own car business became a reality and he established Peterson Motor Company in the Treasure Valley. His love for the car business has been passed down and the company is now operating in its fourth generation. L.G. taught that business should be done the Peterson Family Way–by always offering great service and better prices, by building relationships with your customers, and in return, your customers will reward you with their loyalty. His method of doing business is no secret, but it’s proven to to be true and for 90 years. The Peterson family feels very fortunate to have served your grandparents, your parents, you, and now your children. 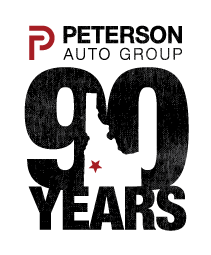 This month at Peterson BMW we are celebrating 90 years and want to pass some amazing savings on to you. 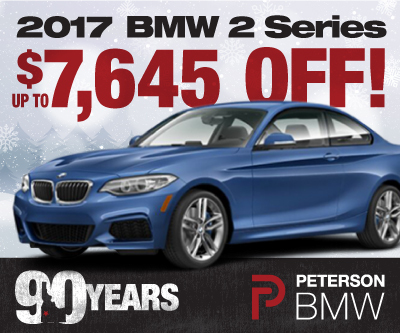 Right now get up to $7,645 off on the BMW 2 Series . All prices are subject to prior sale. Price plus taxes, title and dealer doc fee of $299.See dealer for rebate details. Artwork for illustration only. See dealer for complete details.